Even at home, eight days is a lot of time to pass without printing something mathematical. So today, miniature knots! We can use them around the house as game tokens or poker chips, or just to look pretty. Settings: Makerware custom profile based on the "high PLA" slicer, primarily to make the supports as light as possible under the knots (file is listed below the fold). 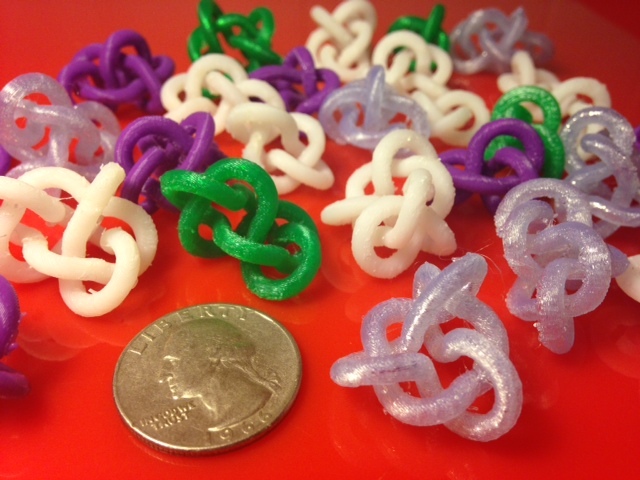 On the Replicator 2 it takes about an hour and 15 minutes to print six of these tiny knots. The white knots in the picture were printed with an Afinia we have on loan in the house for a couple of weeks, and took much longer. Technical notes: These knots were created by taking data provided by mathematician Jason Cantarella of the University of Georgia and using Mathematica to "tube" the data into a format that could be output as an STL file. Each of the knots in the file is a knot with 8 or fewer crossings from the standard knot table; can you tell which ones?